This post is intended to provide some insight into a few of the basic passing game concepts that you see duplicated at all levels and fit into different styles or brands of offense like spread, airraid, west coast, power I and more. 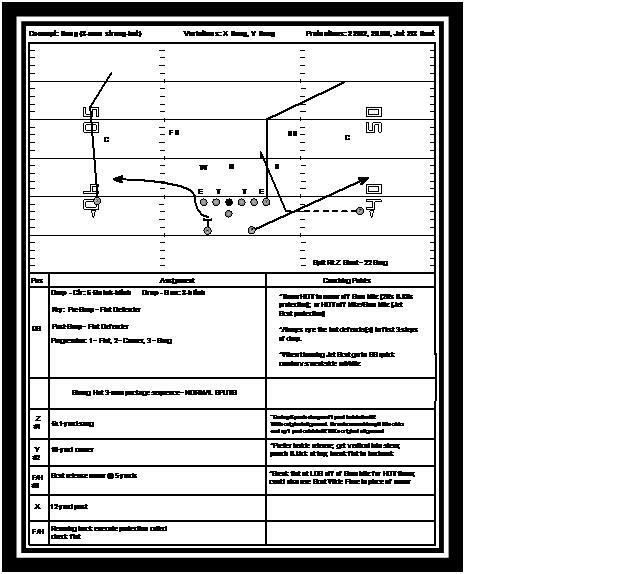 You can find these core concepts in many different playbooks – and although, from team to team, the terminology may differ, the execution will remain the same – each with different combinations of personnel, formations, motions and route packages to ‘dress up’ the play and make it their own. The impetus of these concepts can be traced back to Bill Walsh and the ‘west coast offense’ in what he terms, X & Z Spot & Y-Stick. (Be sure to keep reading below for a more detailed observation of some memorable 49er moments from the past.) 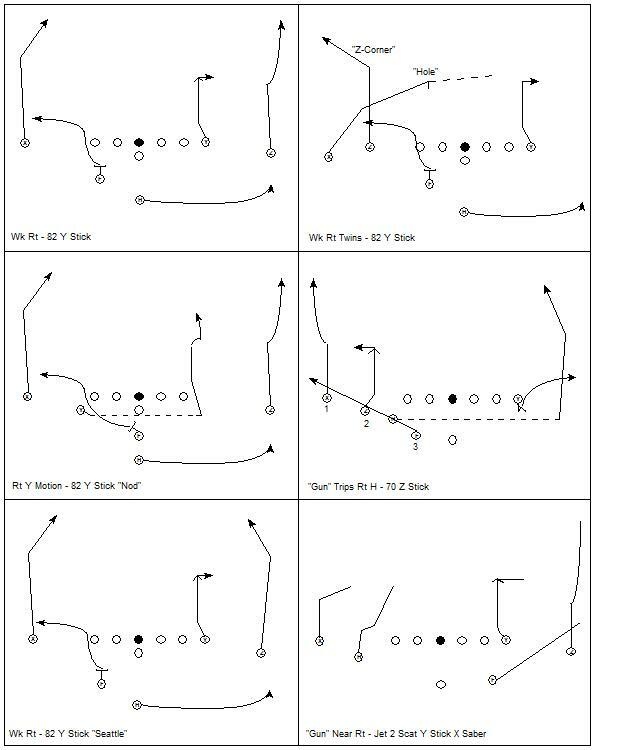 True to form of the ‘west coast offense’ these concepts are excellent ball control, short passing plays which rely on accuracy and timing between the QB & WRs to take advantage of different defensive structures and coverages. Snag is a great passing concept that is used at all levels. Read a breakdown from Chris Brown, of smartfootball.com, on how it’s used in the college game here and in the NFL here (from NY Times Fifth Down Blog). One of the great things about the snag concept is that it has a high value against both man and zone coverages, and when packaged with quick game route combinations on the backside of the play, answers to strong and weak-side pressures as well. The snag is a variant of the smash, where one point is to get a high-low with the corner route and the flat route (except now the flat is controlled by the runningback), with the added dimension of an outside receiver running the “snag” route — a one-step slant where he settles inside at 5-6 yards. 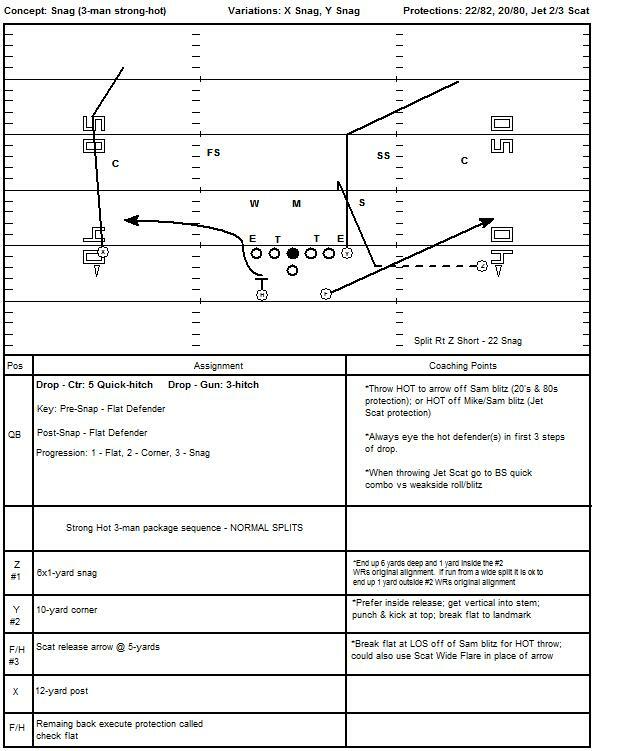 This gives you a “triangle” stretch, where you have both a high/low read (corner to RB in the flat) and a horizontal read from inside to outside (snag route to the RB in the flat). The top left diagram on the second page is an example of packaging the snag concept with a quick game concept. Here we used a simple slant/arrow combination to take advantage of a pressing slot defender with no safety help over the top – hoping to clear out the underneath defender to hit the slant against off-man coverage. If the QB was to see a safety over the top of the two WRs before the snap, then he would look to the snag side and read the flat defender to decide where to go with the ball. Another high percentage and widely used concept similar to the Snag and Spot concepts is the Y-Stick concept. 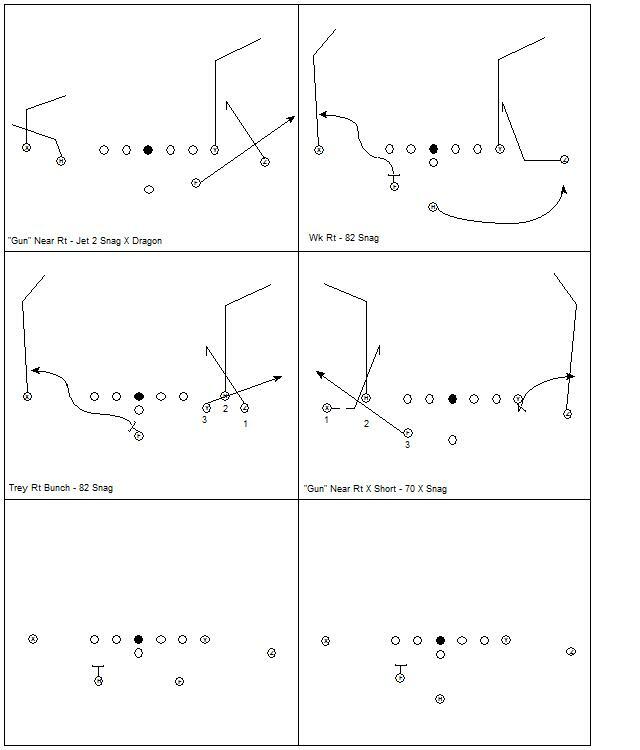 Y-Stick is similar to Snag and Spot in the attempt to stretch the underneath coverage horizontally with a fast hitting route in the flat (usually a RB swinging or running an arrow or shoot type route). 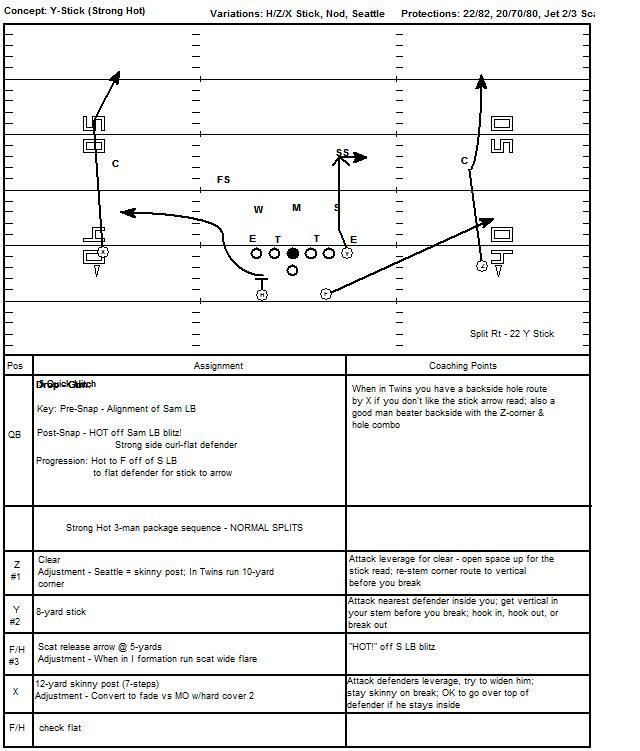 The play can also be packaged in the same vein as Snag and has similar pre-snap capabilities to deal with man, zone and blitz. 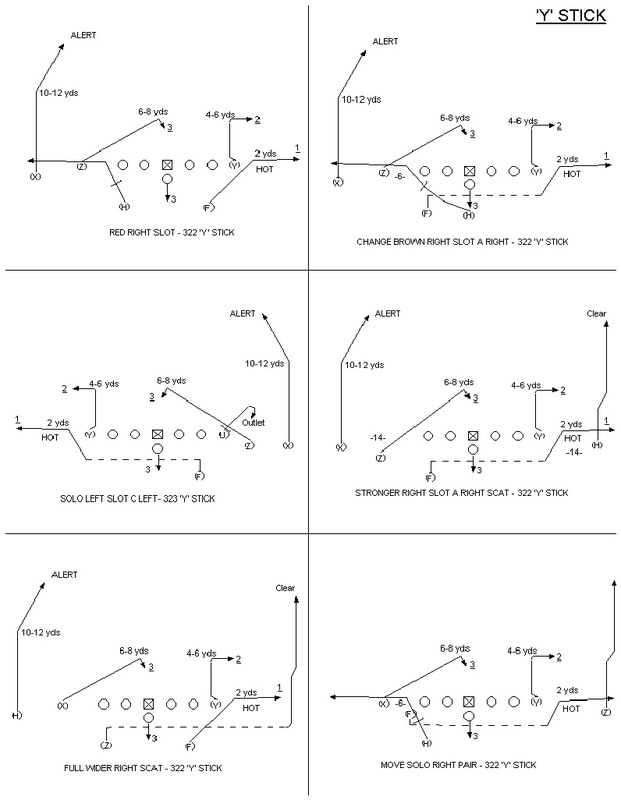 For SF west coast offense purists, enjoy this litany of additional cutups of the SF 49ers running y-stick. Check out Ricky Waters at the 7:43 mark scoring a 55 yard touchdown against the San Diego Chargers in Super Bowl XXIX, breaking the game open on a variation of the play called ‘X-stick H Seam’. 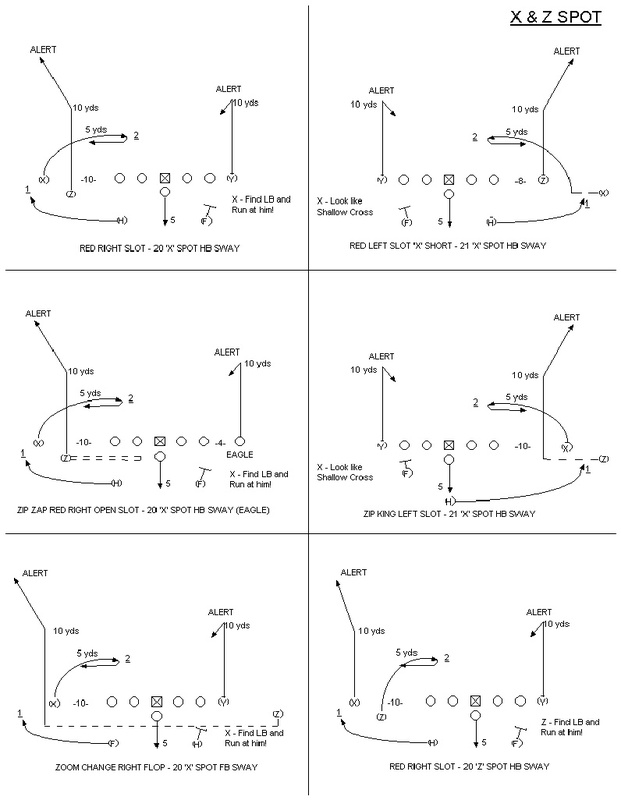 The great thing that the 49ers coaching staff did prior to that game, in the regular season and playoffs (also included in film), was to run a lot of Y-stick from similar formations and motions. This probably started to give defenses a false sense of security as their underneath players would anticipate the play when they recognized familiar sets and motions consistent with down and distance breakdowns (from film study) – prompting them to jump the flat and stick routes. 49ers Offensive Coordinator at the time, Mike Shanahan, took advantage of this conditioned stimulus response he was creating, and added variations such as Stick Nod (a double move by the TE), and Stick Lion (a quick skinny route from the back-side to take advantage of weak ILB strong flow to the primary side), but saved the most effective quick strike variation with the H seam component for the title game of the 1994 season. This play was able to rip a whole right through the heart of the Charger Defense as they undoubtedly overplayed the arrow route and became vulnerable to Waters’ fine tuned route running and pass receiving skills (a quintessential element of the ‘west coast offense’) as he faked to the flat and burst to the seam for a dramatic throw, catch and run. The best part is that they set the whole thing up and most likely knew they were going to score on that play from that area of the field before they ever kicked off to start the game. Now that’s planning for success. Now, when you recognize these plays on Friday, Saturday, or Sunday in the fall, you can play armchair quarterback with the best of them and let the naysayers know that the ‘west coast offense’ is still alive and well today . . . and it is all over the football land scape from high school to the pros.